Here is a list of best free offline antivirus software for Windows. These antiviruses do not need a continuous internet connection to work. Plus, they are also completely portable and you can even use these software from a flash drive without actually installing them in your system. Each of these software is equipped with their own virus definition database and hence does not need a continuous internet connection to work properly. However, you still need to update these software regularly to keep virus definition database up to date. These software help you protect your computer from viruses, malware, trojan, worms, spyware, etc. In most software, you get options to scan the whole system at once or some specific drive, folders, files, etc. After the scan, each software provides a detailed report about the number of scanned files, detected threats, neutralized threats, etc. However, features like real-time protection, anti-phishing, etc. are not available in these offline antiviruses. After the scan, most of the offline software automatically move detected viruses to a Quarantine area. From the Quarantine, you can either permanently delete all detected viruses or you can restore detected files back. Go through the list to know more about each offline antivirus. Norton Power Eraser is my favorite offline antivirus software because it can remove deeply embedded and hard to remove viruses. Plus, it also lets you restore data if some important files get deleted during the scan. You can also check out lists of best free Portable Antivirus, Trojan Remover, and Anti Spyware software for Windows. Norton Power Eraser is a free portable offline antivirus software for Windows. This software does not require internet to scan or protect your system from threats. Plus, you can carry it on a flash drive and quickly scan any system just by connecting it to the system. The main purpose of this software is to scan and eliminate deeply embedded and difficult to detect antivirus that traditional antivirus software are unable to detect. Using this antivirus, you can scan the whole system by using its scan for risks option that will detect and delete all deeply embedded viruses. This scan for risks option scans system pretty aggressively and that may lead to deletion of some important files. However, you can use its Undo Previous Fix option to restore back all the data lost during the scan. In this offline antivirus, you also get various scanning options through which you can perform Reputation Scan (to check files or folders reputation like good, fair, and bad. ), Multi-boot scan (to perform scan on a specified Windows OS while working on multiple Windows environment), and System Scan (to perform standard power scan). This software is also quite good at finding all the unwanted programs of the system. To find unwanted or potentially harmful application, you can perform the unwanted application scan. Comodo Cleaning Essential is another free offline antivirus software for Windows. It is also a completely portable antivirus and you can use it from pen drives and from other portable storage devices without installation. As it is an offline antivirus, you do not need any type of internet connection to scan your system. This free antivirus provides a complete protection from various types of malware, viruses, rootkits, etc. Comodo Cloud Scanners: This feature provides real-time safety verdicts about various unknown processes. Protection from Untrusted Processes: It automatically identifies every untrusted process running on an endpoint which you can manually terminate with a single click. Forensic level stats and graphs: It provides detailed graphs and stats about various internal processes and resource usage which you can easily analyze and check which processes use maximum resources. Endpoints protection: It provides complete protection from threats which can enter to your system through network endpoints. Killswitch: It uses comodo’s whitelist database to isolate or terminate untrusted processes with an extremely high level of accuracy. In this software, you can also manually scan the system. To do that, you need to use one of the three available scanning methods named Smart Scan, Full Scan, and Custom Scan. Smart scan only scans those areas of the system that are most likely to be attacked by viruses. In Full Scan, this software scans every file and folder of the system to find viruses. Custom Scan option lets you manually choose which part of the system you want to scan. McAfee Stinger is another free portable and offline antivirus software for Windows. Through this offline antivirus, you can scan your system to find and remove malware, rootkits, viruses, etc. However, it does not provide complete virus protection and is mainly used with other antivirus software to protect the system. It only scans the system for a specific list of threats which you can view from its Threat List menu. To scan the system for viruses, you need to press the Scan button. Its scanning method basically targets those areas which are known for containing malware and other infections. Though, you can customize the scan behavior from the Settings Menu. Through settings menu, you can vary four scan parameters named as scan targets (registry, rootkits, boot sector, etc. ), scan options (subsidiaries, inside archives, and report applications), on threat detection (repair, report, and rename), and GTI sensitivity. In this offline antivirus, you can modify threat detection settings to specify whether you want to remove, repair, or move threats to quarantine or not after completion of the scan. In case you select move to quarantine, then you have the choice to restore all data back which gets deleted during the scan. Dr.Web CureIt! is the next free offline antivirus software for Windows. It is also portable and you can use it on the go. This offline antivirus software helps you scan and remove viruses, rootkits, Trojan horses, spyware, etc malicious programs. With it, you can scan the whole system at once or a selected part of the system. After completion of the scan, all detected viruses will automatically move to the Quarantine. By going to the Quarantine Manager, you can remove all detected infections permanently or restore deleted files back. If you want all detected malware, viruses, etc. to get deleted immediately after the scan, you need to enable its Cure Mode. Besides this, you can also set some other after scan actions like sound alert, turn off PC after scanning, etc. This freeware has one more interesting feature named as Exclusion that enables you to exclude important data from scanning. ClamWin Free Antivirus is a free open source offline antivirus software for Windows. This antivirus is packaged by portableapps.com in a portable package. Like other similar software, it can also scan and remove all types of viruses and spyware without needing an internet connection. In it, you can manually scan complete system or a selected part of the system, but any type of real-time protection is not provided by it. The main advantage of this software is that it can even scan Primary Memory (RAM) and is able to unload all detected infections from it. Higher detection rate for spyware and viruses. Regular and automatic virus database updates. In general, it is quite a handy and powerful offline antivirus software to protect your system from various malicious programs. Spybot – Search & Destroy is one more offline antivirus software for Windows. The main aim of this software is to find and remove as many malware and spyware as possible. But, you can also use it to clean usage tracks and to fix registry issues. The scanning method of this software is slightly different from other offline antiviruses because it first scans the system to create a Whitelist. A Whitelist is basically a list of system programs which are safe for your system. All the whitelisted programs get exempted from the future scans which reduce the overall scanning time. After the whitelist scan, you can manually scan some specific or all parts of the system to find out all possible malicious programs. Detected viruses and malware get immediately moved to Quarantine Zone from where they cannot negatively impact the system. However, by going to Quarantine menu, you can permanently delete all the detected viruses. Immunization is another useful feature of this antivirus that allows you to immunize PC from various types of spyware. This option basically changes various settings of the native browser like cookies, malware installations, ActiveX, bad websites, etc. to protect PC from spyware. Some other handy features of this antivirus are secure shredder, system repair, report creator, startup tools, etc. Emsisoft Emergency Kit is yet another portable and offline antivirus software for Windows. This software is basically an antivirus utility in which you get two Emsisoft software namely Emergency Kit Scanner and Commandline Scanner. In terms of virus detecting and removing capabilities, both of these software are exactly same. However, they use completely different approaches to perform scans because Emergency Kit Scanner has interface while Commandline Scanner doesn’t. To operate the Commandline scanner, you need to use the console. In Emsisoft Emergency Kit Scanner, you can use its GUI to perform quick scan, malware scan, and custom scan. Once scan gets completed, this software moves all detected infections to the Quarantine from where you can delete infections permanently. It also maintains a log of detected viruses that you can view by going to its Log Tab. 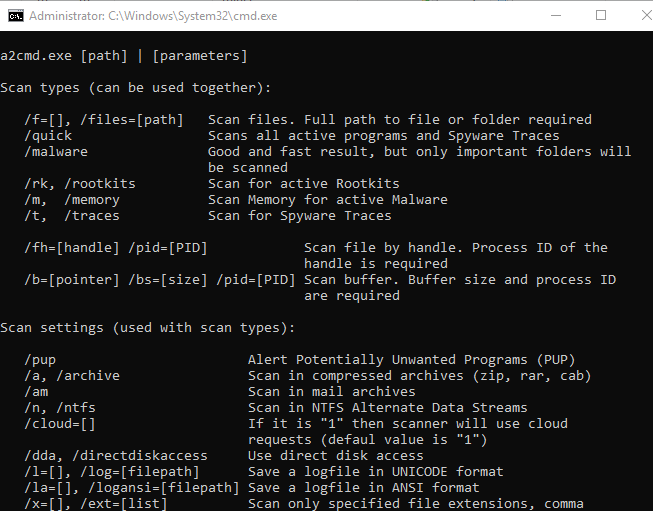 To scan the system using Emsisoft Commandline Scanner,first, launch it and type a2cmd.exe command. As soon as you enter the command, a help page will open up on the console describing all important commands and parameters to use this software. By using available commands, you can scan your system for viruses, rootkits, etc. After the scan, it also moves detected threats to Quarantine just like the Emsisoft Emergency Kit. In general, it is quite a unique offline antivirus software because it provides two completely different methods to scan and protect a system from threats.